When you hit the sand or the pool this year, don't forget your Emoji Towel! 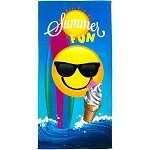 This pure cotton accessory features the popular smiling face wearing sunglasses and enjoying an ice cream cone under the caption "Summer Fun". 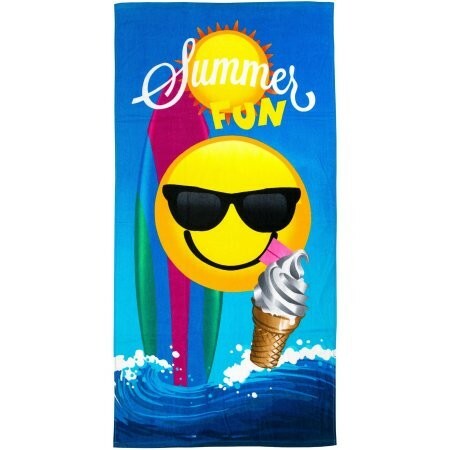 This summer beach towel is done in bright colors and features a surf board over the breaking waves and under the rays of the sun. Stretch on it and soak up the warmth of the day or use it to dry off after a refreshing dip in the water. Even when summer's over, you can use it around the house as a bath towel!